Now that the Southeastern Conference is a basketball league, we should keep a close eye on the happenings outside of Kentucky. Nine SEC teams opened their seasons last night and some looked good, while others (Kentucky and Florida) did not. Duke drilled Kentucky. But you already know that and you are currently trying to convince yourself it was just a really bad dream. Unfortunately, it happened, and it was a crushing blow to the BBN’s spirits. I’m sorry for bringing it up again. Florida got killed. Florida opened its season on the road at Florida State down in Tallahassee, and it was ugly. The 17th-ranked Seminoles won easily, 81-60, by holding the unranked Gators to just 19-of-53 shooting from the floor. Florida State led by as many as 35 at one point in the game, while holding Florida’s best player, senior KeVaughn Allen, to zero points. It wasn’t the ideal start for Mike White’s Gators, the fifth-place team in the SEC preseason poll. Auburn looked scary good. The No. 11 Tigers destroyed a pretty good South Alabama team, 101-58. Auburn shot 51 percent for the game and 47 percent from outside. Point guard Jared Harper had 20 points, 13 assists and hit six three-pointers; Chuma Okeke went for 20 points, nine rebounds and five assists; and Malik Dunbar had 16 points, all in the second half. 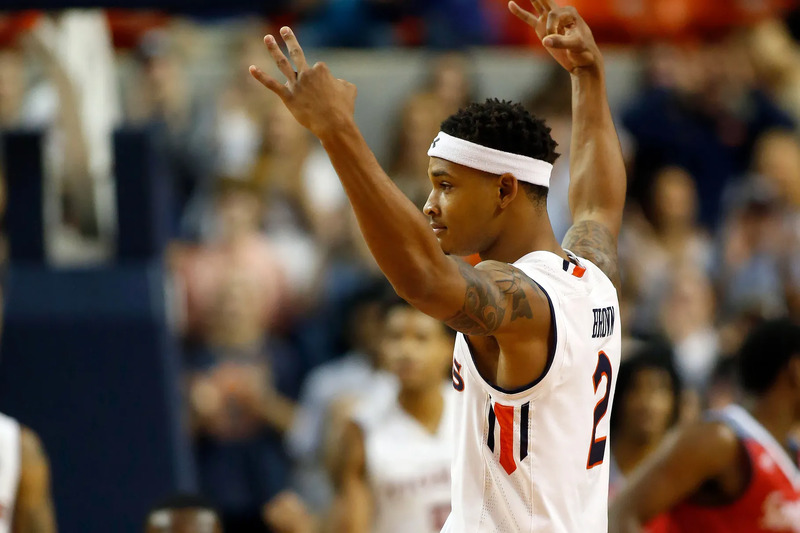 Auburn opened the game by hitting its first six shots, five of them three-pointers. Bruce Pearl has a real contender. No. 6 Tennessee killed some Division II school you’ve never heard of. Any big Lenoir-Rhyne fans out there? I didn’t think so. It’s a small school in North Carolina, where UT head coach Rick Barnes played in the 70s, which explains why the game is on Tennessee’s schedule. Barnes didn’t take it easy on his alma mater Tuesday night as the Vols rolled through the Bears, 86-41. The lopsided affair taught us nothing about Tennessee. LSU’s four freshmen made a strong debut. LSU is the forgotten team when discussing the challengers in the SEC, but Will Wade has some serious talent, even if he had to pay to sign them. (Kidding! Not really.) Naz Reid led the 23rd-ranked Tigers in scoring with 17 points; Emmitt Williams had a double-double with 12 and 10; and Darius Days and Ja’vonte Smart each reached double-figure scoring with 11 and 10 points as LSU beat Southeast Louisiana, 94-63. 3. If we lose, the committee doesn’t really hold it against us come March. I don’t think it’s a bad thing that we took it on the chin early to the best team in the nation. Now our guys know what it takes to play with the best. You don’t get that from beating Lindsey Wilson College by 50. Cal had nothing to do with this game being scheduled as the opening game. It was the NCAA and Champions Classic, in fact I think all 4 coaches did not like it being game 1. For once in my entire life, I’m still in football mode. Go CATS. Let’s take down UT!!!! I honestly did not watch UK Duke game….sounds like I didn’t miss anything…lol. See you in March. You’re not even a basketball fan let alone a UK fan if you didn’t tune into the two biggest names in college basketball facing off. SEC took advantage of a weak college basketball season last year and are extremely overrated this year. We aren’t as far along as we thought and the SEC is NOT back to 2004-2010 status. Hate to break it to everyone. Hate to break it to you but the SEC basketball is the best it’s ever been in 20 years budday. Yes it has been horrible for 20 plus years. May be the best it has been but it is still not good. I agree it has gotten better but still not a deep league. How strange is it, that in one game of UK basketball, losing by 34, is more than our football team has lost by in 9 games, COMBINED, this season? Frick you and that headline Drew. I’m pretty sure Kentucky has an “embarrass the SEC” pass in perpetuity. We embarrassed the league? Give me a break. We are the league.